A good pair of polarized sunglasses, like these worn by guide Garrett Lacy, makes seeing schools of reds much easier in January. Anglers who hit the water in January often say it’s easy to catch redfish, and for those with the right ingredients, it might be. Stock up with these key items, and it can be easy for you too. • Quality, polarized sunglasses. 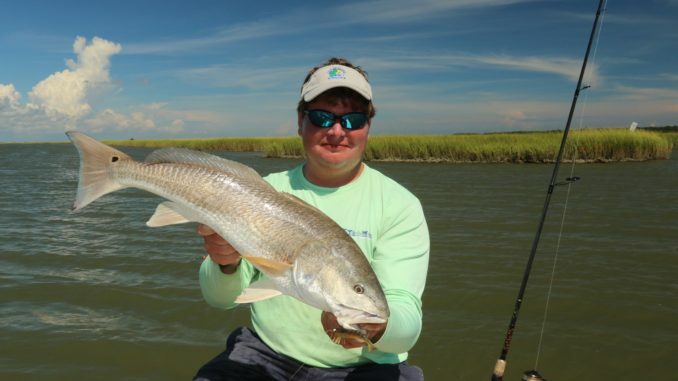 A cheap pair of drugstore shades might keep the sun from roasting your eyes, but it’s not going to help you see schools of redfish below the surface, especially when the water has even the slightest ripples. High-quality shades also do a better job of keeping your eyes from tiring, and that means you’ll have an easier time spotting fish. • A variety of artificial lures and live baits. Some days, redfish will eat anything and everything you throw at them. Other days, they are especially picky. Nothing is more frustrating than seeing a huge school of fish and not being able to get them to bite. It’s even more frustrating when you don’t have a variety of baits to try. • A shallow-water anchor. If you have to toss out a heavy, traditional anchor, you’re going to spook schools of reds, and you’ll spend too much time pulling in anchor when it’s time to move. The schools can change from stationary to moving in an instant, and you need to be able to stay ahead of them as stealthily as possible. A Power Pole or Stick-It Anchor Pin will allow you to anchor in relative silence, and still let you move quickly. • A good trolling motor or a poling partner. Staying on the move is good for two reasons. First, you can move to another school when the time is right. Second, you can stay parallel to a school of redfish and keep yourself in position to cast in front of the leading fish. 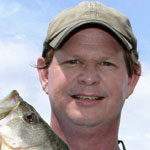 • A handful of shallow flats that hold water, are close to grass lines and incoming water, and have deeper water nearby. Okay, you can’t really stock up on these items, but you can keep a handful of them in your GPS, notebook or in your memory. The best flats hold at least some water, even at dead-low tide. These areas are coveted by schools of reds because they offer safety from Flipper at low tide. With deeper water nearby, the fish can scurry into those holes if other predators like ospreys or bobcats present a problem. And they love to have grass lines nearby to move into when the tide gets high enough.